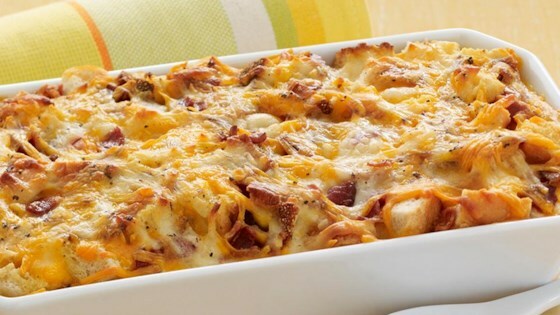 "This one-dish brunch casserole is ideal for a crowd. Add a fruit salad and you can sit back and enjoy your company." Preheat oven to 350 degrees F. Cook bacon in large skillet until crisp. Reserve 2 tablespoons of the drippings. Drain bacon on paper towels; crumble and set aside. Add onion to drippings in skillet; cook and stir 3 minutes or until softened. Beat eggs in medium bowl until foamy. Add milk, mustard, nutmeg and pepper; beat until well blended. Pour evenly over top. Press bread cubes lightly into egg mixture until completely covered. Let stand 10 minutes. A cheesy egg casserole with a simple crescent roll crust. Make Ahead: Casserole can be assembled 1 day ahead. Prepare as directed, increasing milk to 2 cups. Cover and store in refrigerator. Remove cover and bake as directed. Excellent! I used Hawaiian Bread and followed the directions just as written. I assembled it the night before and baked it off in the morning. Delicious. Made this for an after Christmas brunch for 10 people and everyone loved it!